While amusing, I was not going to try making one because I am not a baker. However at the bottom of the recipe, Charles says you can set your final product on fire. WHOA… fire? 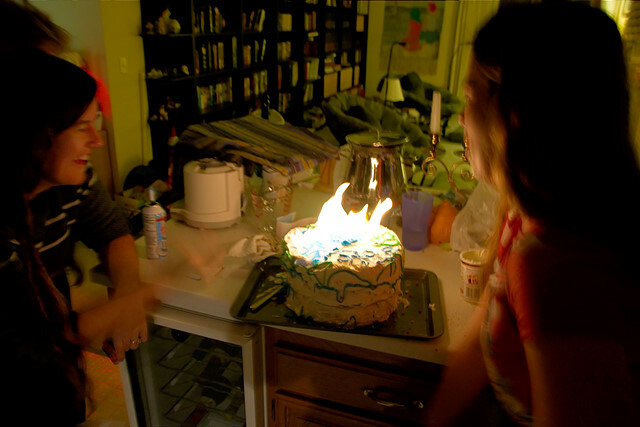 Anytime there is an opportunity to set food on fire where it actually counts as on purpose, I’m interested. It saves me having to come up with excuses for doing it anyway. 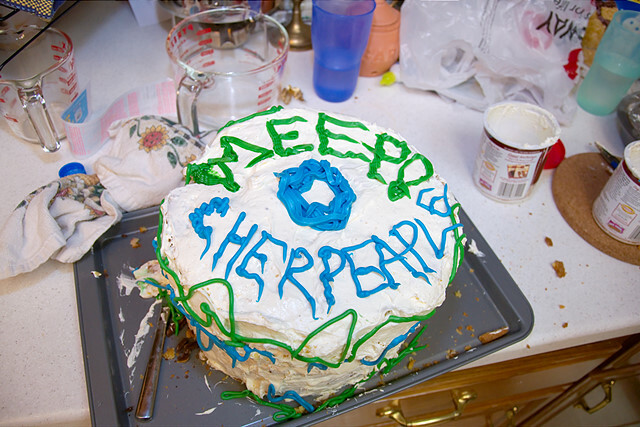 I decided on a Cherpeaple pie. Cherry, peach, and apple. I know Charles added pumpkin, but I don’t like pumpkin, and this is more fun to say. If somebody says ‘what’s in it?’ you can raise your eyebrows knowingly and then ask where one of the guests disappeared to. See, tons of fun. I put chocolate cake mix around the cherry pie, yellow cake mix around the peach pie, and just to add a touch of class, white ‘funfetti’ cake on the apple pie. For those not in the know, white ‘funfetti’ cake mix is like white cake mix except it’s full of sprinkles that melt in the oven, making it appear as though your cake is riddled with bits of brightly colored plastic. Disaster #1: I forgot to add oil to the chocolate cake. Oh well, it probably will come out fine anyway right? Disaster #2: The apple pie was reluctant to leave its home in pie tin #1 and join the cake mix in pie tin #2. Disaster #3: I didn’t know you can’t tell a cake is done by staring at it. Apparently, you have to poke it with a stick. 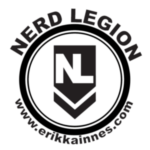 Disaster #4: Did I say stick? I guess it’s a toothpick. Lesson learned. 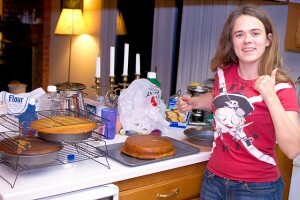 Eventually, I did get three actual cakes with pies inside of them cooked and I didn’t burn the house down. 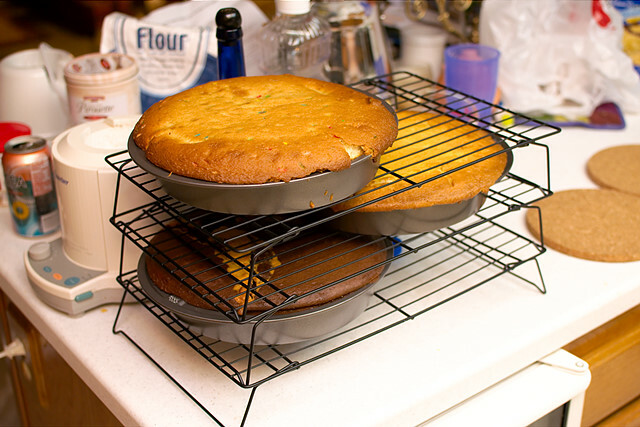 My clever friend who actually bakes things set the cake-pie things to cool on this device, I believe it is called a cake pie cooling rack thing. 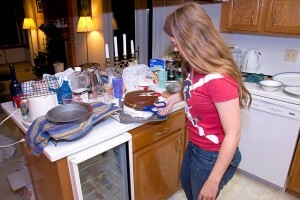 Phase 2 began, which involved getting the cakes out of the pie tins and stacked on top of one another. When Charles does it, it looks really cute. All the cakes are the same size and he artfully trims one of them a teensy weensy bit and they look beautiful. Disaster #5: Do not put cream cheese frosting, or well, any kind of frosting really, on a hot cake-pie. 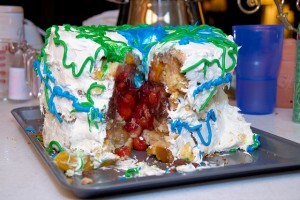 It melts and gets goopy and then it peels up layers of cake when you add more frosting to cover over your mess. Not that this is what happened or anything. Tip #1: Cake frosting is kinda like glue. And spackle. Did you make a mistake? (Not that I did, clearly my work is impeccable.) 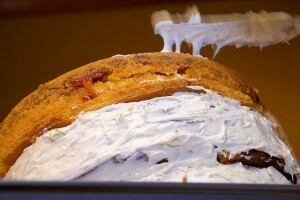 ADD MORE FROSTING! 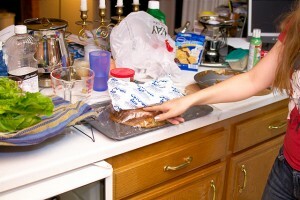 Learning from Disaster #5 and being terribly impatient, I found some interesting methods for cooling the other cake pies. Supposedly good bakers can remove the layers from the tins, set them out to cool and then stack them. 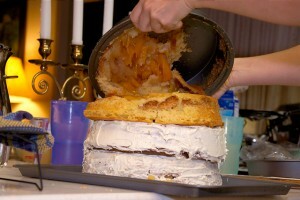 It is sanitary because there is a layer of saran wrap between the cake and the ice pack. Talk about icing a cake oh rimshot! By the way, if you want my advice (which you probably don’t by now), if you wish to cool your cake pie using this method, be sure to move the ice pack around. If you leave it on there, it makes a dent which resembles oh I dunno, a mashed up ice pack maybe. 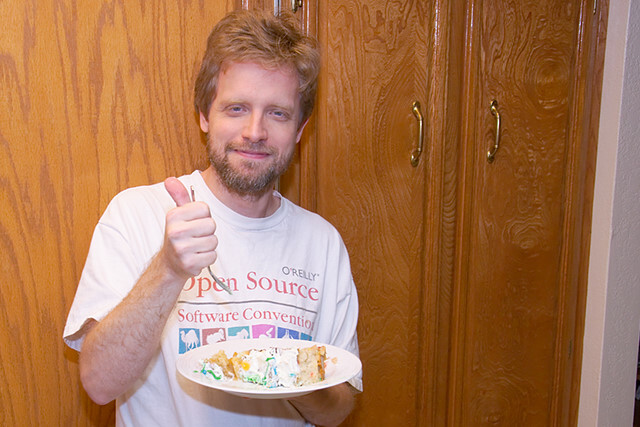 Note: I have no idea why there is lettuce in this photo either. No lettuce was used in the making of this cake pie. 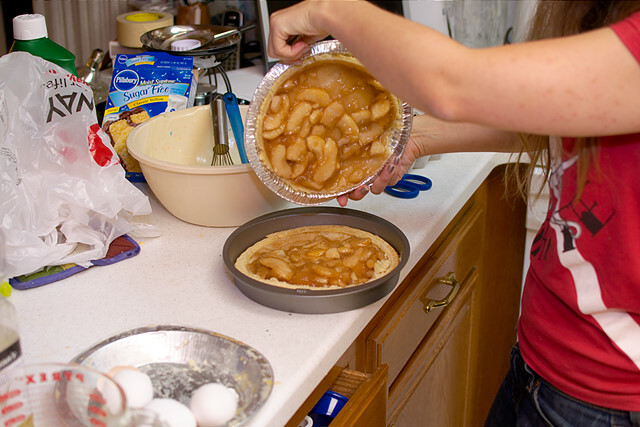 Disaster #6: Peach pie, maybe to punish me for selecting it over the suggested pumpkin pie, refused to come out as one complete pie cake. 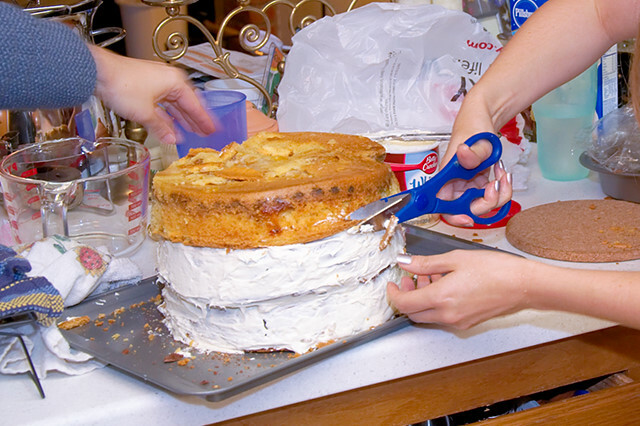 Some people might’ve packed it in at this point and gone for two layer, but one of my hobbies is sculpting so I just scraped it out of the tin and shaped it into a cake kinda shape. 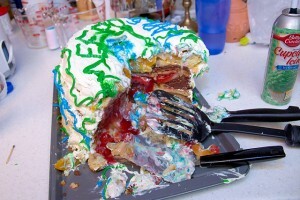 At this point my friend stepped in since the cake pie was in need of a serious make over. She sculpted while I trimmed. It was all very professional. 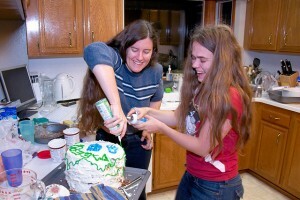 Once we finished frosting the monstrosity I mean cake, it was time to decorate it and get it all dolled up for the boys. 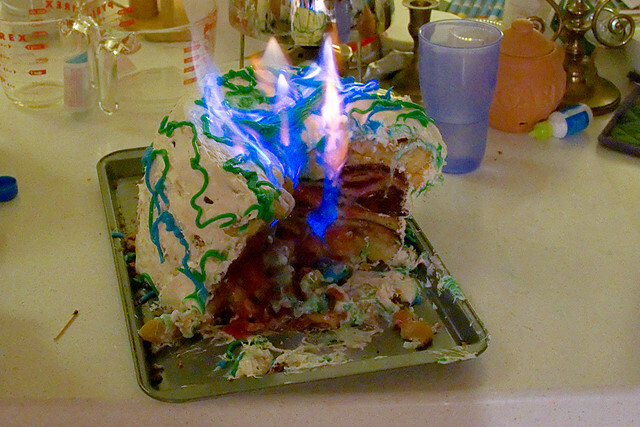 I wanted to set it on fire, so I made a tasteful blue ring on top of the cake for the flame to sit in. Lovely isn’t it? The sad part is at the beginning I was kinda trying to make it look nice. FAIL! 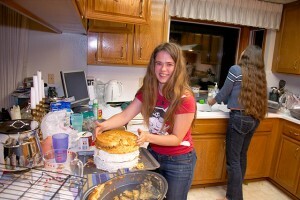 My friend was not the slightest bit interested in making the cake presentable. She said the freedom to scribble all over the cake was “liberating.” I guess she is probably right – everyone secretly wants to decorate a cake and go nuts with it. 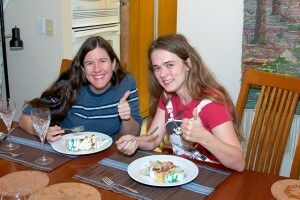 She put the title of a film we made together with some other people on top of the cake (Meep!). 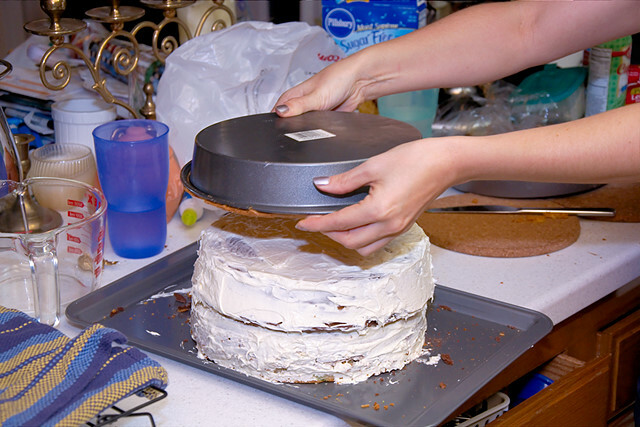 Fortunately you cannot see the back of the cake in this image…there was an air pocket in her frosting can and it blasted a big glob of frosting on the cake. 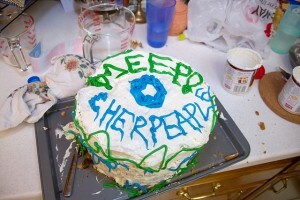 I tried to write “Cherpeaple” on the front of the cake. 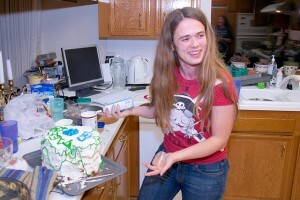 Disaster #7: Decorating a cake is harder than it looks. At last the masterpiece was complete… Ta-da-AUGH! I am available as a professional baker for weddings but not children’s parties. 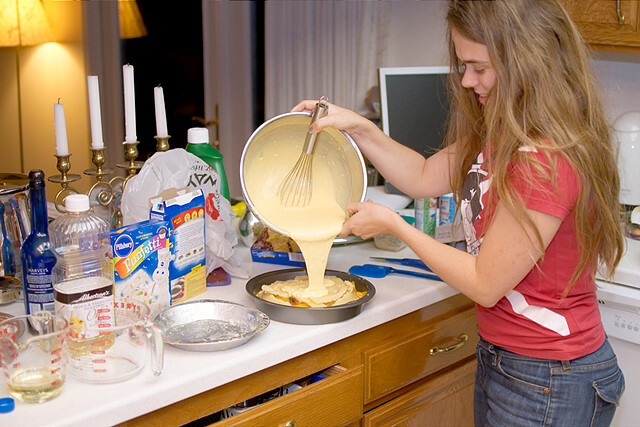 No kid is going to out bake me right where I can see. 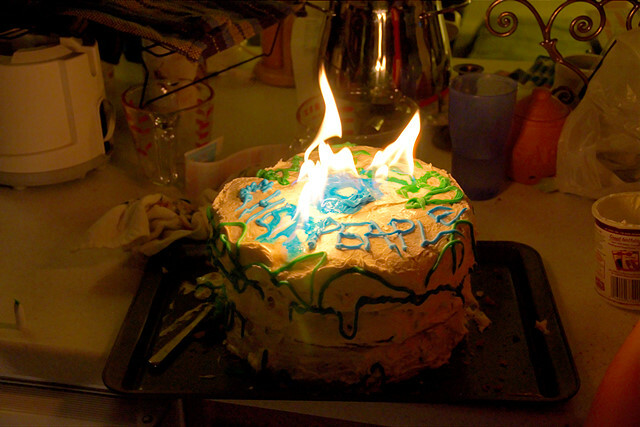 With the final cake complete, it was time to set it on fire. Charles says you can do this with lemon extract. The ring was to hold the lemon extract but my hand slipped and I got it all over the whole entire top of the cake oops. 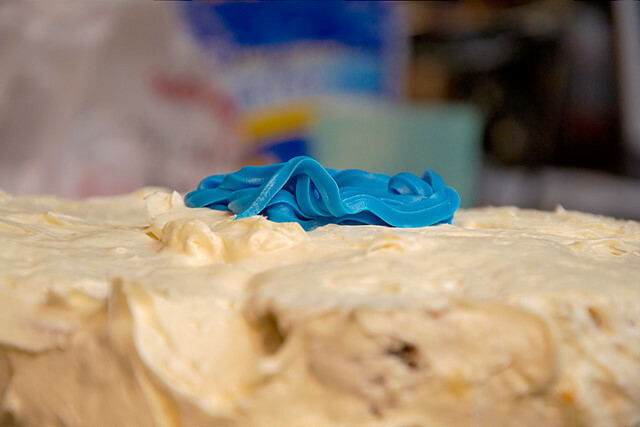 Disaster #8: Did you know frosting melts under intense heat? I did not get oohs and aahs. 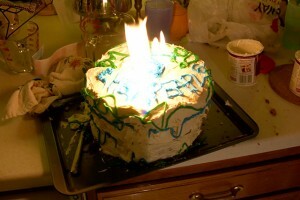 However the owners of the kitchen I baked this thing in did mention they are getting a fire extinguisher. Doesn’t it look delicious? Kidding aside, it’s actually pretty tasty, it’s all your favorite cakes and pies in one place and it’s only 2000 calories or so per piece. Just for good measure I set it on fire again. This time I accidentally upended the rest of the lemon extract bottle. And there we have it, documented proof that I am not a baker. 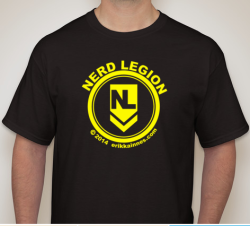 However, this was incredibly fun to make. 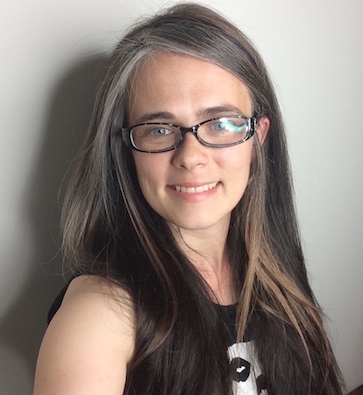 I am pleased to annouce I have officially discovered the definition of ‘hot mess’ (please refer to images above). I am thrilled that Charles Phoenix invented this dish. 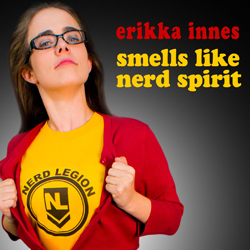 UNBELIEVABLY CLASSY ERIKKA INNES!!! WOOOOO! You know, that looks delicious. Nice work!